Seriously. I can't figure out how to explain it. Novint can't figure out how to explain it. So, watch this video, which tries to explain it. If you don't understand what it is yet, well, I can't help you anymore. But enjoy this randomly technical description that follows anyways. I worked hard on it, and I did it JUST FOR YOU. Yes, you. A bit of background (this will contain much glossing as I'd like to focus on the falcon, but it's good to have a knowledge of what's out there otherwise). In the world of haptics, there are two major types of controllers. Serial (pen type controllers), and parallel. An overview of a bunch of the different hardware types is available in an article on bracina.com. The NovInt Falcon is a parallel robot. Parallel robots are called such because they have multiple chains of joints working together to create the final position of the controller (or end effector, if you want to be technical about it). Not to mention, the math uses parallelograms to line up the positions. If you watch a lot of How It Works (which, if you have cable with the Discovery Channel, you invariably end up doing no matter what. That show is video heroin. ), you've seen these before. They're real popular in pick and place operations. That's exactly what it sounds like. Pick something up, put it somewhere else. Repeat ad inifinitum. Puttin' things in or on other things. They're good at that. So, you're probably like "But it's all pointing down"
Ok, look more familiar now? The NovInt Falcon is a parallel robot turned on its side. It's actually a Delta variant of the parallel manipulator (Here's a nice overview of the Delta Haptic Device, which is quite similar to the Falcon/Omega setup). If you want all sorts of interesting history about where it came from, check out this article on parallemics.org. But for now, we'll just say: France. It came from France. There's lots of reasons why using parallel robots in haptics is important. However, I don't quite understand the math behind it all yet, so I'll just repeat what all the webpages say. "Good stiffness and accuracy in a small workspace". Having used some serial controllers before, I can see what they mean. Hard definitely feels... hard. I'm sure I'll be talking more about this in later articles on the development of libnifalcon. To show a bit of what else is out there, here's the ForceDimension and their Omega series of controllers. Once again, looks familiar, no? Ok, and the Omega comes with a PCI interface and all sorts of APIs and what not and FD is actually an offshoot of the subset of France that we mentioned above that created this whole thing in the first place, but still. That's some significant 0's worth of difference there. There's rumors that ForceDimension helped out on the Falcon design. There's also rumors that it came from Sandia with Tom. Only Art Bell truly knows. So why all this about parallel robots? Well, many future posts will be talking about research in this field, so I figured I'd at least introduce the term. There's also lots of reference and searchable material in here if you're interested in going your own direction with this information. Anyways, back to hackyness. Now that we've got that out of the way, what's inside it? 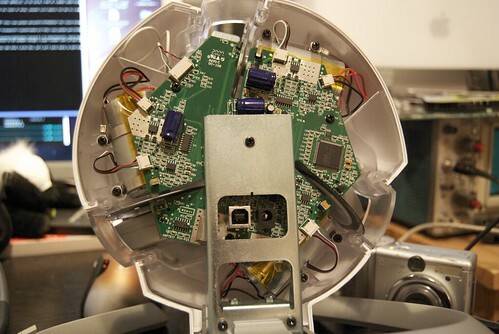 Click the image below to go to an annotated flickr picture of the insides. Yes, the falcon is quite possibly cranking 30W through the motors when you max the torque on all the axes. I don't have specific parts on the 3 motor blocks in the circuit (they're all exactly the same), but what you've basically got going on there is three really large old style mouse encoders. Each of the 3 large wheels attached to the motors have a disc attached to them, alternating little clear slots with opaque slots. There's a photoresistor that shines light through those slots. Whenever the light goes through (clear), you get a 1. Whenever the light is blocked (opaque), you get a zero. And that's how we know how far the motor has gone. Whether direction is measured using some sort of quadrature encoding or Back-EMF polarity is something I forgot to check (but will do so at the point where I can figure out how to write my own firmware for this thing). Now, for the part I kinda sorta know more about than the other parts. The Falcon uses the FTDI chip as it's main communications link to the computer. Everything is filtered back and forth through the FTDI chip, converting from USB on the computer side to RS232 on the circuit side. This is because it's orders of magnitude easier to program your microcontrollers to talk RS232 than it is to talk USB. Novint distributes and uses the stock FTDI driver with their software. The only change they've made is to the VID and PID. They've chosen to use FTDI's free "have a PID" program, which has them listed under FTDI (0x0403) as a vendor, but with their own special product ID (0xcb48, as opposed to the default PID for FTDI chips, 0x6001). NOTE: I have not actually proven this next paragraph, it's more what I think is going on than anything. You might've noticed in the Internal Circuitry section that there are two microcontrollers on the board: the PIC and the TI. This is where the bootloader sequence comes in. The TI DSP uC is actually reconfigurable on connection to a PC. The PIC acts as a bootloader, maintaining the logic needed to run the FTDI communications to pick up firmware and program the TI with it. This allows a developer (currently just Novint, since I've had no luck analyzing the pins. Stupid tiny LQFP pins and my shaky hand.) to possibly speed up the control loop on the internal processor depending on application specific needs. Damn fine idea, even if it did crank the price of the hardware quite a bit, I'm sure. When a program wants to connect to the falcon, the following sequence occurs (if you want to follow along, check out nifalcon_libftdi.c). Note that the bauds get funky, because baud rate actually turns into a clock subdivision on the board, so I just converted the rate to the lowest clock subdivision possible that would still make them work. See the How I Mapped The Test Firmware Protocol section for more info. After we've gotten this far, we're ready to run an I/O loop to the falcon. So far, the only firmware that's usable with code I've written is what I call the "test" firmware. This is the NOVINT.BIN file included with the drivers, that the utilities in "c:Program FilesNovintFalconTestUtilities" in a normal windows nVent (I HATE NVENT but that's an article for another day) install will use. Rather than repeat the info here, if you're interested in the packet layout of the test firmware, check out my wiki page on it. So, that's pretty much all I know about this thing right now. I'm working on learning the math behind the haptics and placement algorithms, and while I learn, you'll get to learn along with me, in the form of reading my ridiculously long blog posts! All of this is going into code form in the libnifalcon project on Sourceforge. As of this writing, v0.2 is sitting in the repository waiting for me to finish a few cleanup things. As you can see, right now I'm more interested in getting a code platform built and teaching myself haptics programming from the ground up than I am in implementing any specific application. However, I do spend a lot of time in Pd playing with the falcon at the moment, and will most likely be posting interesting projects out of that in between code geekouts. Mapping the test firmware protocol was fairly easy. I used SniffUSB to record the packets going to/from the Falcon in the test programs, then compared the data in those with the protocol mapping for the FTDI available in the libftdi source code. The bootloader code is basically a handwritten replay of this sequence, except translated back into FTDI driver calls instead of pure USB comms, hence some of the weirdness in the explanation (the "send 3 get back 5" seqeuence, the odd baud rates, etc...). This was, quite literally, all it took. No amazingness or code breaking or whatever. Figuring out the packet setup was just a matter of mapping the numbers from the test GUI to the changing bytes of the packets. libnifalcon comes in two flavors right now. This is the free, reverse engineered version of FTDI's drivers, that use libusb. They seem to be stable across all platforms, though I only recommend using them for anything non-windows (or non-publically distributed on windows. Don't make people switch drivers if you don't have to.). It's GPL'd, too, so if you want to use libnifalcon under libftdi, you're stuck with the GPL too. Meh.